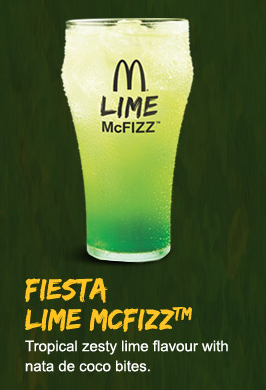 Those with a keen eye in the Beef Picante review may have already noticed a photo of the Lime McFizz, which was the promotional drink which launched along side this new World Cup series. Although I'm not the biggest fan of the McFizzes, I'm glad they didn't simply re-release one from before, slap a football word in front of it, and call it "new" like they did with the Banana Pie. Not only is this a new McFizz flavour, this is also the first time they have added something inside of the McFizz. Traditionally a McFizz is Sprite + syrup of whatever flavour they are trying to create, sometimes it has fruit pieces, sometimes not. This is the first time they've added something else to the drink. 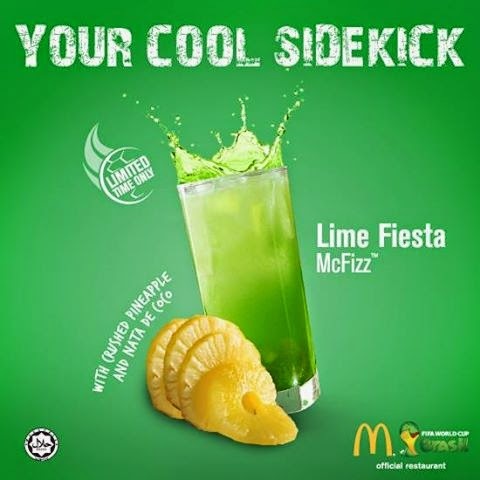 The Lime McFizz included little bits of Nata De Coco. Not surprisingly, the first time I had ever heard of this before was a couple years ago, before I moved to Singapore in 2011, when they had the Double Lime Sundae with Nata De Coco. I suspect whatever company supplies McDonald's with the lime syrup sells it along with these chunks of coconut. It's also very possible that the it was the same chunks from the Lime McFlurry I had in Malaysia 2012, since they were the smaller version, unlike the large chunks in the Singapore Sundae. I'm on to you McDonald's! Living in Singapore the last 2 years, I've noticed this stuff pop up in drinks here and there, but more strangely it's often in yogourt! The lime flavour was stronger than any of the other McFizzes I've had, and although you could taste the lime (and it was clearly, Calamansi Lime) the taste of Sprite overpowered it. Something about adding sugary syrup to Sprite just turns me off, and my teeth hurt just thinking about it. Adding even more sugary bits of Nata de Coco didn't help. They were so small, and because the drink was so overpoweringly sweet you couldn't taste them at all. Also, most were too large for the McDonald's straw, which meant they kept getting stuck and preventing me from finishing it. McDonald's Malaysia has also launched the same drink along side their World Cup Promos, but they've gone for full sugar overload in trying to top Singapore, and added crushed pineapple to it! I was just in Malaysia today to try their new items where I saw someone order it, it was double the size of Singapore. So I happily gave it a pass for something sugar free.